CET Teleport is one of Europe`s major teleports and was built by Deutsche Telekom in 1987 for satellite broadcast and VSAT services. The Teleport is located in northwest Germany giving it a commanding view of the skies, with visibility from the Eastern Pacific, the West Coast of the USA, South America, and covering Europe and Africa all the way across Russia and China, and all of Asia and down to Australia. The Teleport is host to more than 50 antennas from 15m downwards, operating in C-, Ku-, Ka-, K- and X-bands, fully integrated into Deutsche Telekoms German fiber network, providing CET with access to the terrestrial network for Internet connectivity as well as data and voice backhaul. Access to BTs Global Media Network (GMN) via BT Tower allows for the transmission of video enabled MPLS data & voice services. The STM fiber between the CET hub and the Tower is bi-directional and fully redundant. The teleport has a potential of accessing more than 200 geostationary satellites, located from 58 degrees West to 76.5 degrees East, providing coverage and connectivity across most of the visible globe. Energy costs are spiraling upwards while carbon footprints and sustainability have become the rallying cry. In addition, customers are increasingly including power consumption and green initiatives as decision criteria in contracts and equipment purchases. So its not surprising to find the satellite industry, and in particular the teleport sector, taking on the Go Green challenge. As the economic climate of 2009 was still under the sway of the global economic crisis that started in 2007, the MSS (Mobile Satellite Service) industry was largely stagnant in 2009  some MSS operators even reported a decline in revenue. Global wholesale revenue stood at $1.27 billion for the six MSS operators currently active, reflecting 2.8 percent industry growth from 2008  the lowest for the last three years (though still higher than the growth in 2005, when the MSS industry suffered from a post-military conflict effect). Martin Coleman started Colem as a satellite and broadcast engineering services and design consultancy. His next step was to create high quality Network Management Systems. At IBC, he announced a new company, Colem-Spice, formed by the union of Colem and Spice Design, long-term business partners. He was recently appointed Chairman of SUIRGs Carrier ID Video committee. SUIRG (Satellite Users Interference Reduction Group) is a global industry organization dedicated to combating the increasing and costly problem of satellite radio frequency interference. Christopher F. Hoeber has more than 35 years of industry experience and he leads the systems engineering and program management groups as well as oversees all of the companys research and development programs. Mr. Hoeber has a broad base of experience in systems test and engineering, and program and functional management  he was the leader of the systems engineering team that developed SS/Ls geostationary satellite platform, the modular 1300. Satellites play a crucial role in our lives, from global security and defense to local in-car navigation. On a daily basis we rely on them for telephone communication, television and radio reception, and long-range weather forecasting. Many of these satellites use operating platforms and payloads designed and built by Astrium, an expert in space applications for more than 40 years. Employing 15,000 men and women in France, Germany, the United Kingdom, Spain and the Netherlands, Astrium is a wholly owned subsidiary of EADS, a global leader in aerospace, defense and related services. Today, its all wireless. Whether pointing a dish at the sky, making a 2G or 3G mobile phone call, or connecting to a WiFi or WiMAX hub, its all about the magic of radio waves. And yet, until fairly recently, the three forms of wireless existed in separate silos, unable to make the connection. The Royal Caribbeans Oasis of the Seas, the worlds largest cruise ship, has been equipped with MTN Satellite Communications (MTN) state-of-the-art VSAT satellite communications system. The 1,184-foot (360.9-meter), 225,282-gross ton Oasis of the Seas carries up to 5,400 passengers and a crew of more than 2,000. The satellite communication requirements for such a massive ship presented special challenges. Montreal-based OmniGlobe Networks recently announced its intention to procure, launch and operate its first Ka-band Fixed Satellite Service (FSS) geostationary communications satellite serving Canada. The application for the the orbital slot was initiated in 2009 and CANUK-1, a medium-sized high throughput spacecraft, is planned for launch during the third quarter of 2013. The Global VSAT Forum is escalating a global effort to have public money earmarked for SATCOM projects. The opportunity has its roots in an international effort to bridge the digital divide; an increasing number of governments have established universal service funds (USFs) in which billions of dollars are now deposited for use in supporting communications projects. 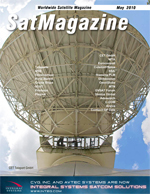 However, allocation of those funds is often delayed, or governments are unaware of the unique role that SATCOM services can play in enabling USF-supported projects. Focus... BGAN Adoption Surges Across Multiple Markets, by Ian Canning V.P. Marketing and Product Management, Stratos Global Corp. In just a little more than four years, adoption of Inmarsats BGAN broadband mobile satellite service has surged to more than 30,000 activations across multiple vertical markets. In nearly 200 countries, prominent media organizations, military agencies, first responders and other remote professionals have come to rely on the service for reliable, high-speed communications in areas where terrestrial or cellular networks are damaged, congested, non-existent or too difficult to deploy. Advantech Satellite Networks offers a two-way, open standard (DVB-RCS), broadband satellite access system.SatNets DVB-RCS Hub, and in particular, its Return Link Sub-System (RLSS), is at the heart of the broadband access system. Yes, a misquote of the famous Shakespearean line, but you have to admit, it IS catchy. Thank you, Sir William. Usually the answer to that question is not a conscious decision. In the satellite business, some people would say we are very green. After all, other than when they are launched, thousands of satellites floating around in space are all running on solar power. No coal by-products, little fossil fuels being burned (just enough to keep them in orbit), no nuclear waste  the sun is being used to generate power. This is so green; its hard to get any greener. Todays service providers and satellite operators are under substantial pressure to maximize profits and minimize costs while providing customers improved reliability and higher capacity services. In the race to compete with industry peers, wireless services and terrestrial capacity, service providers and operators must constantly look to improve bandwidth use and user throughput to stay ahead.